The Magician is the person who programs and runs Elfpack. He fixes the bugs, makes changes and tweaks the site to make it better. Additionally, he make changes when the Council annoys him into it, and he keeps an eye on things to make sure the Warden doesn't get too corrupt. 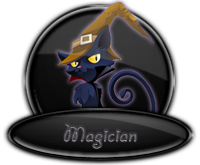 The Magician Apprentices are the people who do not have direct access to the Elfpack Server and thus cannot recode Elfpack, but their extensive help and knowledge of site-workings have earned them this acclaimed position. 2007-02-11 [shinobi14]: =( No fair! [Hedda] gets to see and we don't? Sna??? "Im a Magician, Deputy Warden, and a God" Yerrsss... I can see that..
2007-10-01 [Young J.C.]: I think the whole "God" position is just pushing it. Don't you think? 2007-10-02 [zoloftzantac]: oh, get over yourself J.C.
2007-10-02 [Young J.C.]: Okay, question, get over what? I'm just saying, I would never worship Hedda. I'm not religious. I don't believe in a God. So, once you tell me what exactly I am suppose to get over, I may just do so. 2007-10-02 [zoloftzantac]: it was a joke dude, doesn't J.C. stand for Jesus Christ? 2007-10-02 [Young J.C.]: Oh, I'm not very good with those jokes, on the count that that is my initials to my name. So then I apologize for getting al upitty. I don't remember signing up for this. Well, *shrugs* work is work. 2013-02-08 [Schlachter]: Sure, if it makes you happy. @Sammie: There's no reason to delete someones' comment. Besides, it was her asking what a Magician is, that got me to write the description. 2013-02-09 [sammie h! ]: Aye, I didn't delete any comment??? I was responding to that..